Leicester and Ireland fullback Geordan Murphy is one of the most valuable assets in the Tigers' armoury, having cemented his place as one of the finest attacking fullbacks in the northern hemisphere. 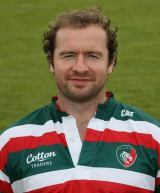 Murphy's early career was spent on the wing thanks to the presence of Tim Stimpson at Leicester, but he impressed sufficiently to win his first Ireland cap against the USA in 2000. Murphy was an ever-present in the Ireland squad for the next two seasons, winning the Irish Sport Writers Player of the Season award at the end of the 2003 season. Murphy broke his leg prior to the 2003 Rugby World Cup, but his ambition saw him bounce back into the Ireland squad. He was selected for the British and Irish Lions in 2005, winning a Test cap in the third and final Test against the All Blacks. Murphy's international career was increasingly been spent scrapping with Girvan Dempsey for the fullback jersey, with both players being taken to the 2007 Rugby World Cup. Murphy warmed the bench for the early games, before starting the decisive fixture against Argentina, which Ireland lost. Murphy made four appearances during the 2008 Six Nations and two on tour to Australia and New Zealand, before being recalled by new Ireland coach Declan Kidney for Ireland's final autumn international against Argentina. He retained his place in the Ireland set-up for the historic 2009 Six Nations Grand Slam season - featuring as a replacement in four of the games. And he also tasted success on the domestic stage skippering Leicester, in the absence of Martin Corry, to the Guinness Premiership crown and the final of the Heineken Cup. He was installed as Leicester's official captain ahead of the start of the 2009-10 season but his campaign got off to the worst possible start as he dislocated his shoulder against Wasps in September, ruling him out of action for the remainder of the year. His return came at the start of the Six Nations and he was soon back in the international setup. He deputised for the injured Rob Kearney as Ireland beat England at Twickenham and retained his place for the subsequent clashes with Wales and Scotland in spite of Kearney's return to full fitness. Murphy then lifted the Guinness Premiership once more at the end of the season before being included in the Ireland squad for the summer tour of New Zealand and Australia, during which he captained his country for the first time, in the clash with the New Zealand Maori. He featured only once during the November internationals, against Argentina, but looked set to reclaim the No.15 jersey from the injured Kearney for the 2011 Six Nations. However, Murphy suffered an ankle injury in Leicester's Aviva Premiership victory over Northampton on January 8 and it was later confirmed that he would miss the entire Championship, and potentially the rest of the season. Despite missing the rest of the season, Murphy found his way back into the Ireland set-up. And he completed a remarkable comeback having been named in Declan Kidney's 30-man squad for the tournament at the expense of the injured Felix Jones.